It's been at least two months since my last taco recipe so we are WAY overdue, friends. 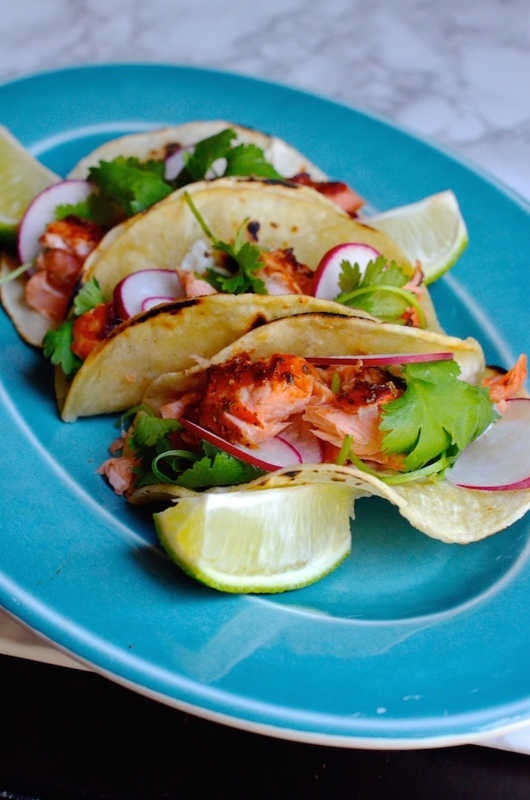 This time around it's all about these spicy Chipotle Salmon Tacos with an easy Cumin-Lime Mayo sauce. Salmon is already packed with tons of great flavor, so you really only need a few other simple ingredients to pull these together in record time. They're an ideal weeknight meal, or great for a lazy weekend when you have mouths to feed, but not much motivation. You start out by prepping the salmon. 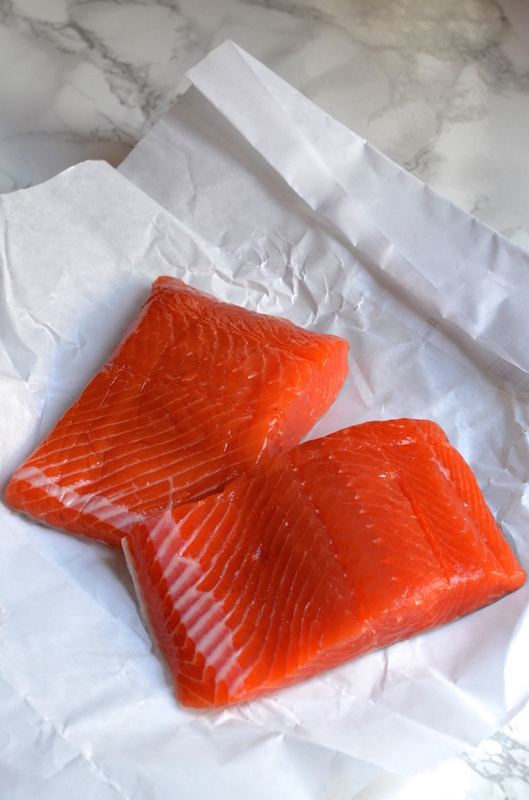 I like to get a big gorgeous piece of wild salmon as it's the best in terms of flavor and nutrition, but definitely pick your favorite kind. I pat it dry then brush with the adobo sauce from a can of chipotles in adobo. I literally just scoop out a few spoonfuls of it straight from the can to the fish and brush it on evenly. Sprinkle liberally with salt, pepper, and some oregano, and you're done! Let it cool slightly then use a fork to flake it into large chunks. The sauce is just mayo with some fresh lime juice and cumin, whisked together. 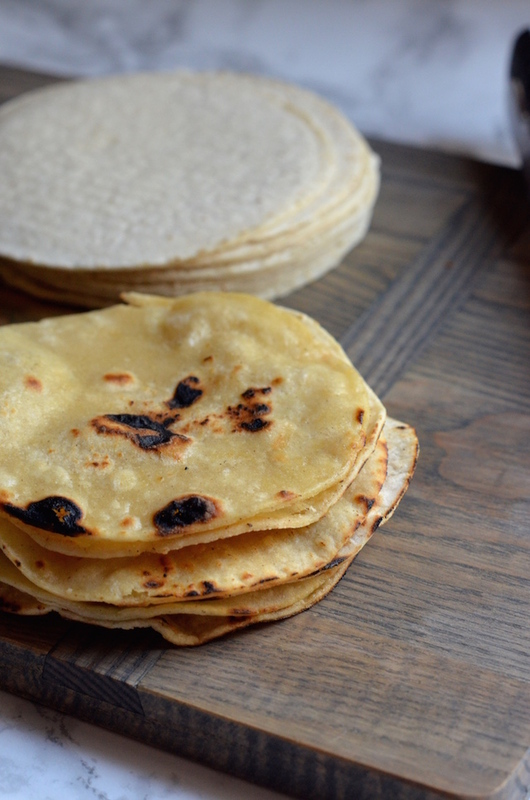 Do NOT forget to warm up the tortillas on a hot skillet or right over the flame. Don't just use tortillas straight out of the package--that's like eating a hot dog straight out of the package. It's cooked, technically, but...it's just not ready to eat, yet. The rest people can do themselves! Serve the salmon with the sauce and tortillas and your favorite toppings. I keep it simple with sliced radishes and cilantro. Chopped onions, avocado, cabbage slaw or any other number of classic taco toppings would work here, too. And let's connect so you can find out the next time I post! Follow me on Twitter, Instagram, or Pinterest, become a fan on Facebook, or sign up to receive my once-a-week e-mail updates. Preheat broiler. 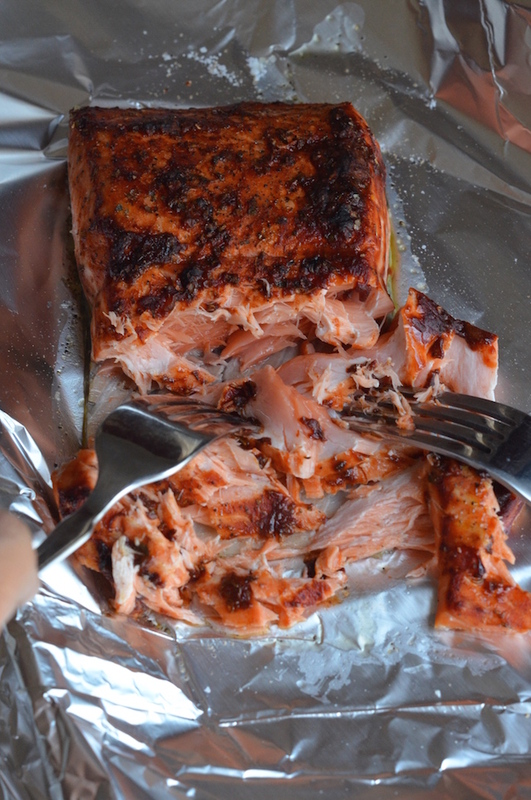 Line a baking sheet with foil and place salmon fillets on top. Spoon out three tablespoons of adobo sauce from chipotles (reserve the peppers for another use). Brush sauce over the top and sides of the salmon. Sprinkle generously with salt, pepper, and oregano. Broil about 6" away from broiler for about 7-10 minutes or until cooked to desired doneness. While the salmon cooks, whisk together mayonnaise, lime juice and cumin. 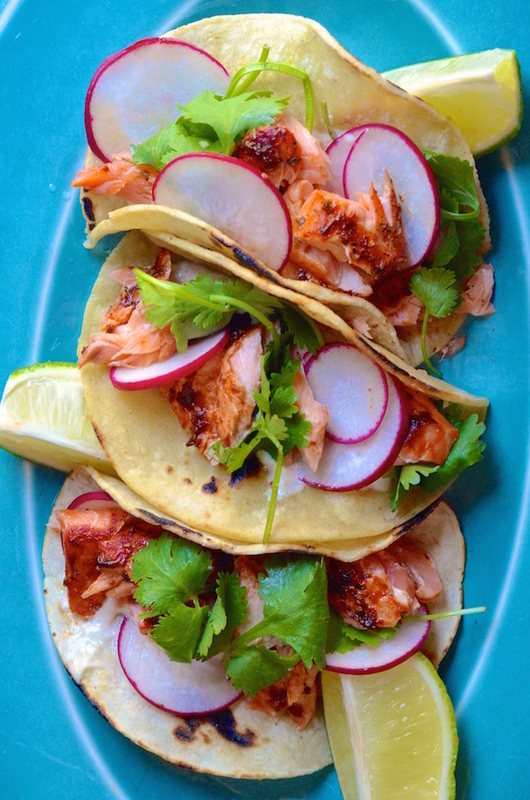 Remove salmon from oven and let cool slightly while you heat tortillas on a skillet or over a gas burner. Use a fork to flake salmon into chunks. To assemble tacos, spread warm tortillas with mayo sauce and top with salmon and desired toppings. Eat immediately.